This Larson Electronics 75KVA Power Distribution System includes a 600-amp three phase 480 volt main breaker panel on the primary side and a 200-amp, 120/208Y 3-phase main breaker panel on the secondary side. Both panels are rated NEMA 3R. 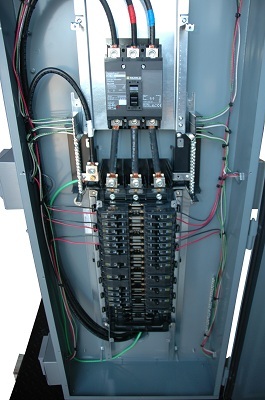 Sixteen 480V, 3-wire, 4-pole receptacles are protected by six 40-amp breakers, four 30-amp breakers, four 100-amp breakers and two 60-amp breakers. 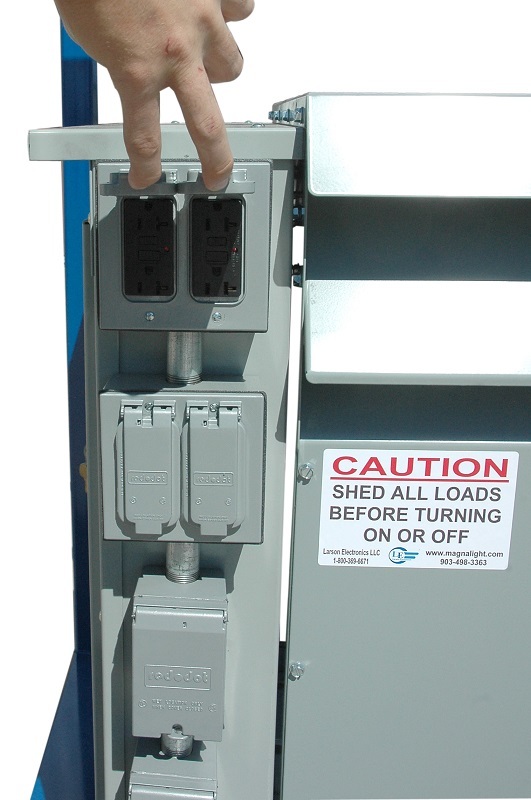 A separate 480V, 200-amp disconnect with separate enclosure is included (no associated outlet). 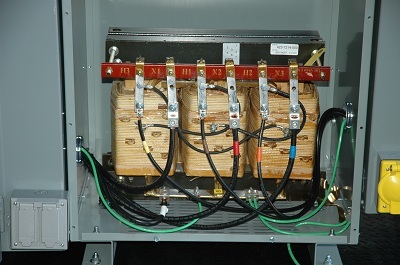 The 480V primary panel feeds the 75 KVA 480V to 120/208Y transformer. The NEMA 3R transformer feeds the 200-amp, 120/208Y secondary load center. This 200-amp main breaker panel provides three 60-amp, 125/250V, 3-pole, 4-wire receptacles protected by 60-amp breakers; two 50-amp, 125/250V, 3-pole, 4-wire receptacles (Nema SS2-50R) protected by 50-amp breakers; and six 120V GFCI receptacles protected by 20 amp breakers. 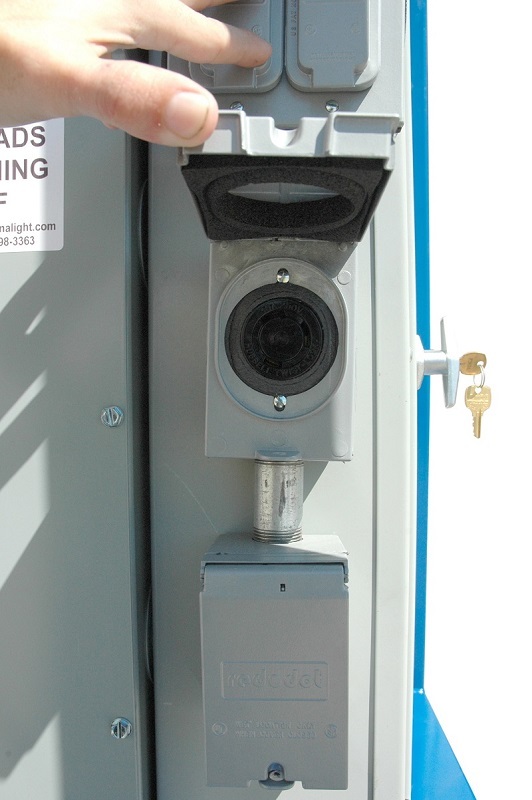 The transformer is mounted on a 1/8” thick steel plate mounting platform and the load center/distribution assembly is mounted within a 2-inch square carbon steel tubing frame, resulting in an extremely stable and well protected power distribution platform. This model is equipped with four heavy duty polyurethane 8-inch locking casters, skid pockets and a top located lifting eyelet. The entire frame is powder coated. 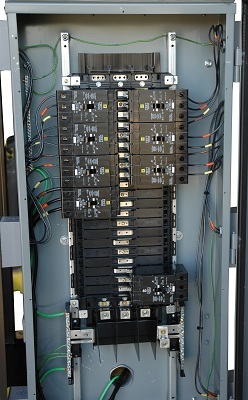 This power distribution system is ideal for indoor or outdoor use and applications including but not limited to construction sites, plant maintenance, plant turnarounds, hazardous location operations, shows, exhibits, and shipyard operations. These power transformers are popularly used in applications where external power sources are often necessary and work well in combination with explosion proof lights and equipment.